A quick note to let you know about a new KB article that has recently been published which reports incorrect values for Outstanding IO in the VSAN Observer tool used for monitoring performance of VSAN deployments when using vSphere 5.5U2. 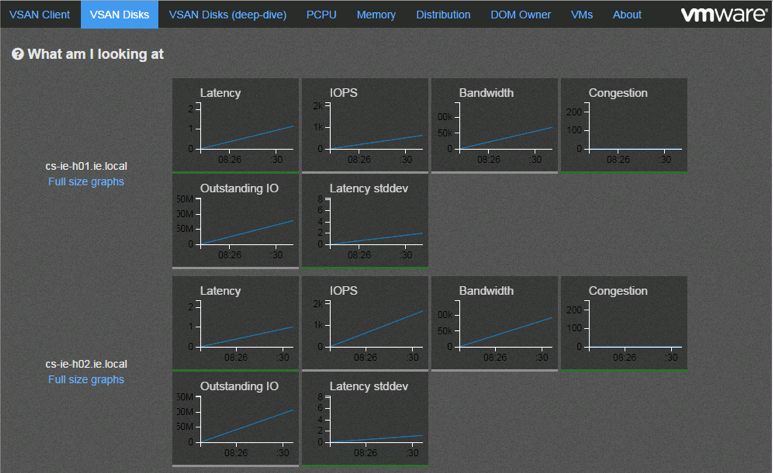 Virtual SAN (VSAN) Observer graphs in the “VSAN Client”, “VSAN Disk”, “DOM Owner” or individual VSAN object on the “VM” tab show very high Outstanding I/O (OIO) value that is inconsistent with the actual I/O load. Of course, this behaviour may lead to you “chasing your tail” so to speak when monitoring or troubleshooting VSAN, so we are working on getting this resolved asap. Check the KB article regularly for updates regarding a fix. In the meantime, understand that a high Outstanding IO count in VSAN Observer is expected and may not be the symptom of any underlying issue.